Comics Underground and Dark Horse Team Up for Will Eisner Week! ON THURSDAY, MARCH 7, Comics Underground is teaming up with Dark Horse Comics for a Very Special Episode of our comics reading series. 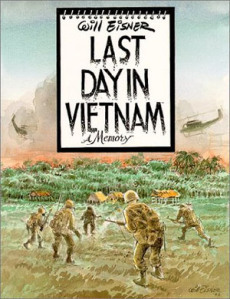 In honor of Will Eisner Week, Dark Horse Editor Diana Schutz hand-picked a lineup of some of the best comics creators in the country to share stories from Will Eisner’s Last Day in Vietnam. Brian Michael Bendis, Matt Fraction, Michael Avon Oeming, Dylan Meconis, and Kelly Sue DeConnick will be reading, and Erik Nebel will be accompanying a wordless story on violin. Basically, it’s a lineup that shouldn’t be allowed to get on an airplane together, because if that plane crashed, so would like 80 percent of the comics industry. Here’s a bit more info on the participants. LIKE YOU NEED MORE INFO, C’MON. • MATT FRACTION, architect of the Marvel Universe, writer of The Invincible Iron Man, and creator of the beloved high-concept spy comic Casanova. • BRIAN MICHAEL BENDIS, yet another architect of the Marvel Universe, writer of Ultimate Spider Man and creator of the beloved superhero noir comic Alias. • MICHAEL AVON OEMING, a creator and artist on numerous projects including the Eisner-winning series Powers. • DYLAN MECONIS, creator of the brainy historical graphic novel Family Man and the vampire-themed spoof Bite Me. • KELLY SUE DECONNICK, writer of a number of Marvel Comics titles, including the well-received Osborn miniseries and Avengers Assemble. • ERIK NEBEL, creator of War and Peace: The Comic, which is just what it says it is. It all goes down at 8 pm on Thursday, March 7, at the Jack London (529 SW 4th, Portland, Oregon). Admission’s $3-5. Yes, it’s going to be as good as it sounds. See you there. Comics Underground was a quarterly comic book performance series in Portland, Oregon. The final Comics Underground was on June 12, 2014. Did you miss it? Woe is you, forevermore. Comics Underground is proud to be sponsored by Bridge City Comics and DC Vegetarian. Like getting email? Have we got a deal for you! Comics Underground · Comics… in a basement.